During the attack on Ahmici on April 16, 1993, HVO members killed 116 civilians, including the elderly, women and children. The youngest victim was a three-month old baby, while the oldest victim was 82 years old. Genocide in Ahmići, 16 April 1993, was planned and executed systematically and in organized manner. It is the worst crimes committed against Bosniacs during the aggression against the Republic of Bosnia and Herzegovina. In the case of Ahmići, ICTY established that the Republic of Croatia committed an act of aggression against the Republic of Bosnia and Herzegovina, which credited this armed conflict the character of international armed conflict “due to the direct involvement of the Croatia Army and the general control of Croatia over the forces and authorities of the Bosnian Croats”. Eight persons have been held responsible for the genocide in Ahmići, of which only two for their direct participation in the crimes, and six on the grounds of command responsibility. The Ahmici genocide was the culmination of the Lašva Valley ethnic cleansing. It is the single largest massacre committed by the Croats against Bosniaks in the Bosnian war. The attack began at 05:30 hours on April 16, 1993. 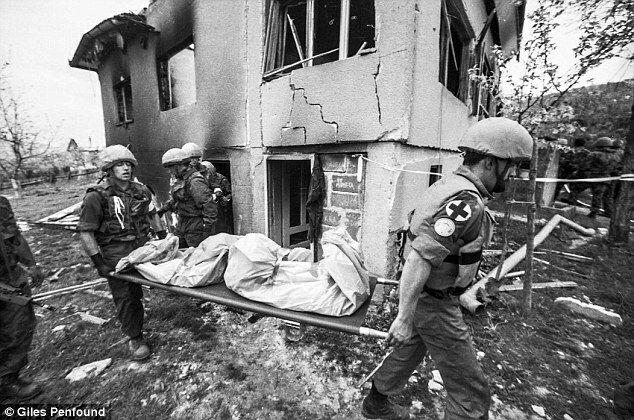 The Croat Defence Council (HVO) shelled the Bosniak part of Ahmići and moved in killing many Bosniaks, including women, children and the elderly. They destroyed a large number of Bosniak homes, and caused extensive damage to the village’s two mosques. An estimate puts the death toll to at least 120. The youngest was a three-month-old baby, who was machine-gunned to death in his crib, and the oldest was an 81-year-old woman. After the Ahmici genocide, Croat leaders, supported by propaganda efforts, tried to deny the massacre or to blame other sides in the Bosnian War. Dario Kordic denied to Payam Akhavan, an investigator with the United Nations Centre for Human Rights, that the HVO were involved in the Ahmici massacre; indeed, he said that his men, as good Christians, would never commit such acts and blamed the Serbs or the Bosniaks themselves: according to him, no investigation was necessary. A similar response was given by general Tihomir Blaskic to British Colonel Stewart in Kordic’s presence. The massacre at Ahmici – where 116 were killed – was the biggest committed during the conflict between Bosnian Croats and the Bosnian government. Its discovery shocked the world and brought home the brutal, genocidal nature of the conflict taking place in Europe less than five decades after the end of WW2 and the discovery of what happened to Europe’s Jews under the Nazis.The Ahmici massacre was not the worst of the war – Srebrenica saw 7,000 Muslims killed by Serbs – but it was the worst massacre carried out by Croats against their neighbours.The attack was preceded by political declarations announcing a conflict between Croatian forces and Bosnian forces ‘imminent.’ On the day of the attack, telephone lines had been cut because all communication exchanges in the region of the village were under the control of Croat warlords intent on seizing land from Muslems they had hitherto lived alongside peacefully. An European Community Monitor Mission observer said he had ‘seen the bodies of children who, from their position, seemed to have died in agony in the flames. Some of the houses were absolute scenes of horror, because not only were the people dead, but there were those who were burned and obviously some had been burned with flame launchers, which had charred the bodies and this was the case of several of the bodies’.The International Criminal Tribunal for the former Yugoslavia in The Hague ruled that these crimes amounted to crimes against humanity in numerous verdicts against Croat political and military leaders and soldiers, most notably Dario Kordić, political leader of Croats in Central Bosnia who was sentenced to 25 years in prison for his role in the Ahmici slaughter. He was released in June 2014 after having served two thirds of his sentence.